To the top of old Ethan we go-va. The ridge under four feet of snow-va. In the name of the great Jehovah. Kevin Burke, K-man, David Hathaway (leader). Photos: Dana, Kevin, and David. 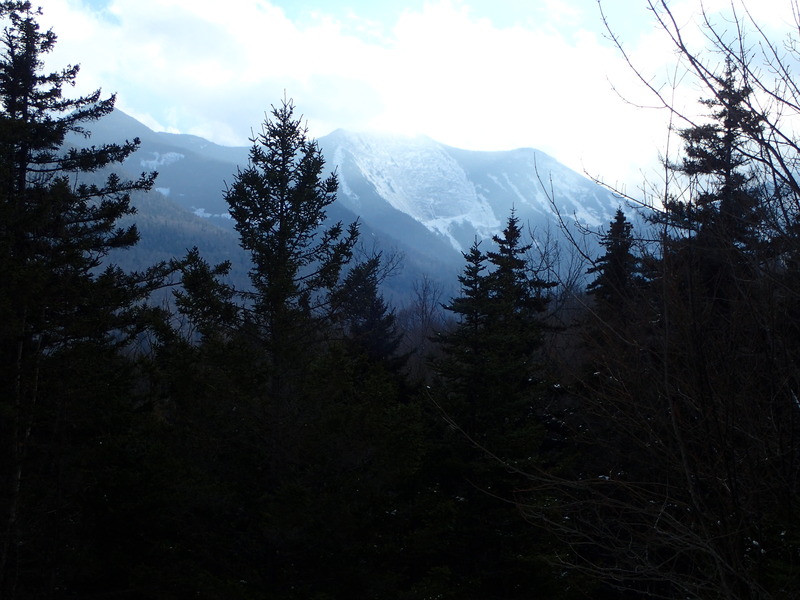 There was a lot of interest in this hike, but in the end we had a group of seven experienced hikers. Some of us carpooled from Hinesburg while the others met the group in Lincoln. Even though we didn’t start until a little after 10 a.m., it was very cold and we all bundled up. 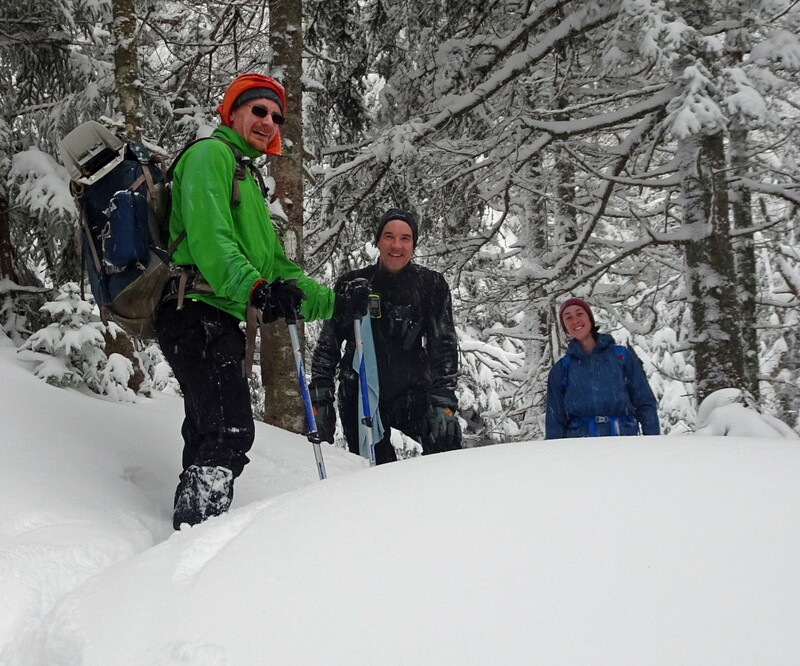 The trail had been broken after a recent heavy snowstorm but not packed, so we all put on snowshoes for the hike up. 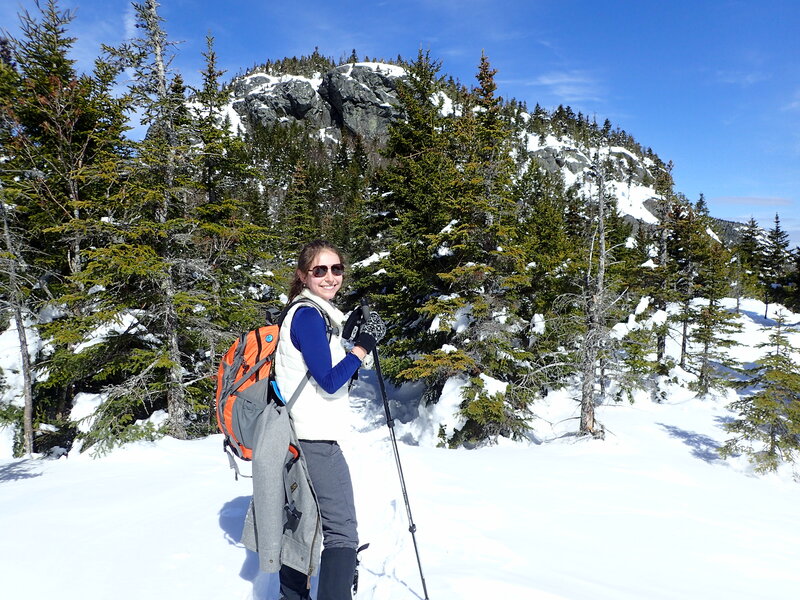 Although it didn’t warm up a great deal and it was very windy on the summit, the sun was out and it was a gorgeous day. 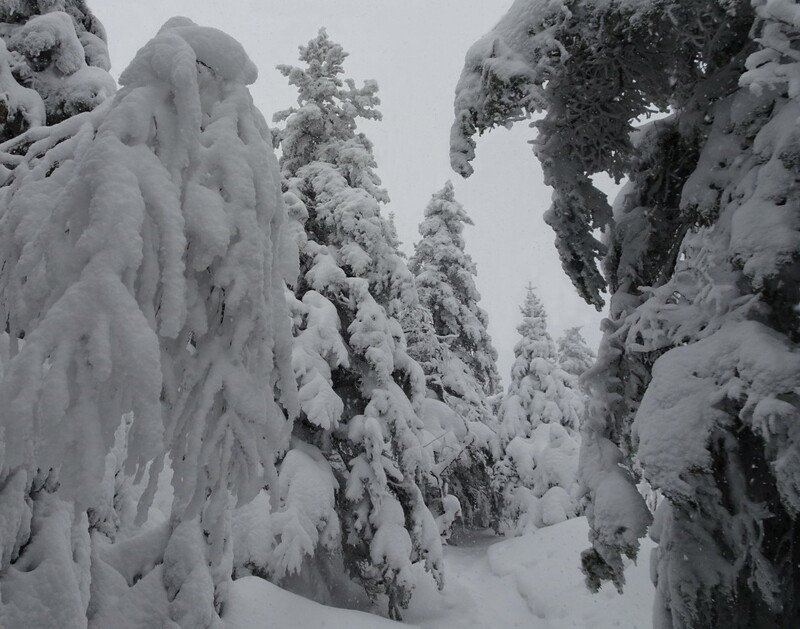 With the trees laden with snow and the blue sky above, the views were absolutely spectacular. 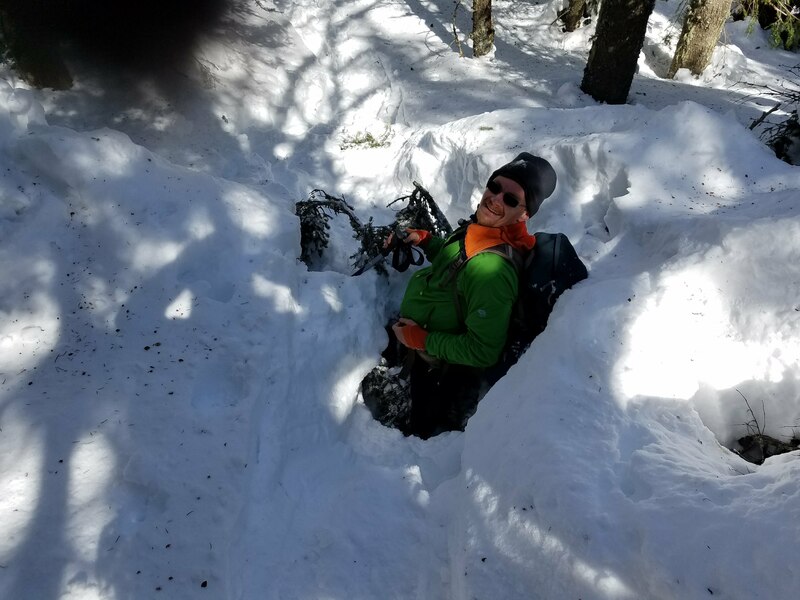 We opted not to stay on the top for lunch and instead went down to Battell Shelter, where we found a lunch spot in the sun and out of the wind. 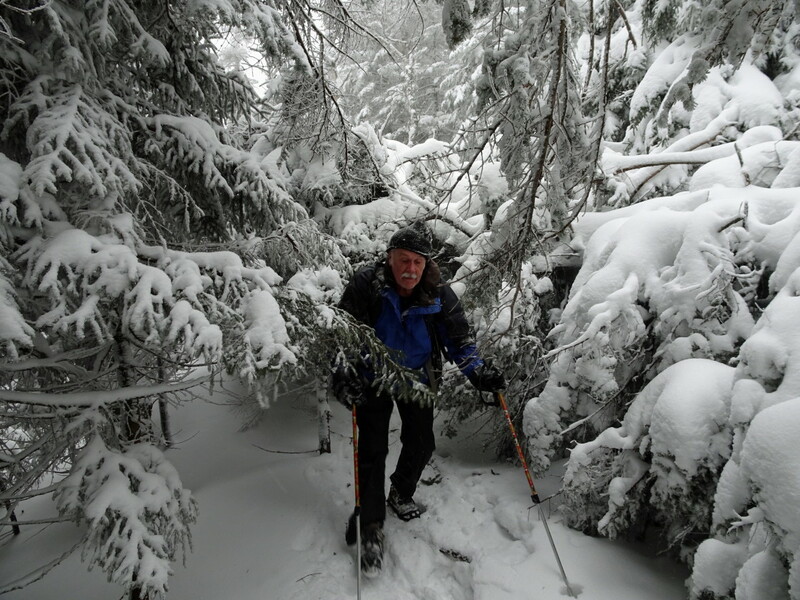 After lunch, one person’s snowshoe binding broke so he hiked out with just boots. 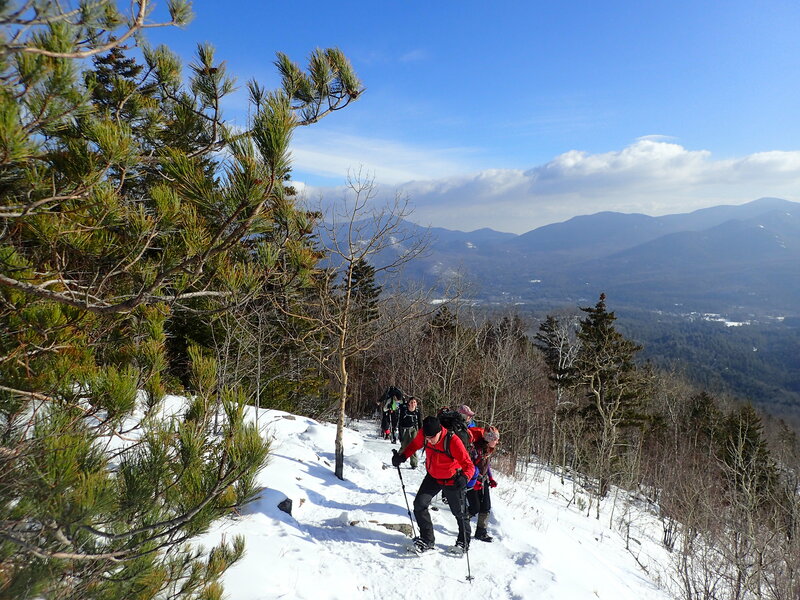 Two members of the group used sleds part of the way down, while the rest of us snowshoed out. At the bottom, we had a few snacks and then returned home. All in all, it was a great hike and a fun group of hikers. Participants: Steve Titcomb, Kevin Burke, Jill George, Alan Finn, Ken Austin, Rich Larsen, Sheri Larsen (leader). Photos by Steve Titcomb. Ice, ice baby! Not the song, but what we found on the trails. 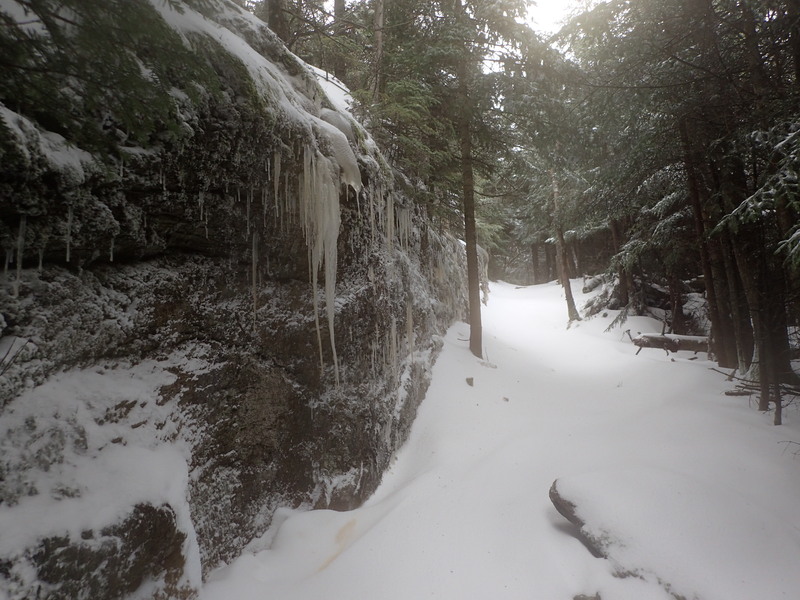 After doing a short trip up to Cantilever Rock on Tuesday and encountering ice all the way up the state park road from the winter parking area and in many spots on the trail, I required all participants have spikes or other real traction devices with points (not Yaktrax!). And although I almost never wear spikes, I did so for this entire trip (people who’ve done winter hiking with me know what that means). We met at the Underhill Center park and ride at 9 AM and took three cars up to the winter parking area (Jim had a 3:30 deadline for getting down, so brought his own car). We got the last spots in the pullout area, but the road had been sanded a little way further, and I’d seen that some folks had been parking by the side of the road in that area. I mentioned this to folks who came in right behind us, and they headed up. 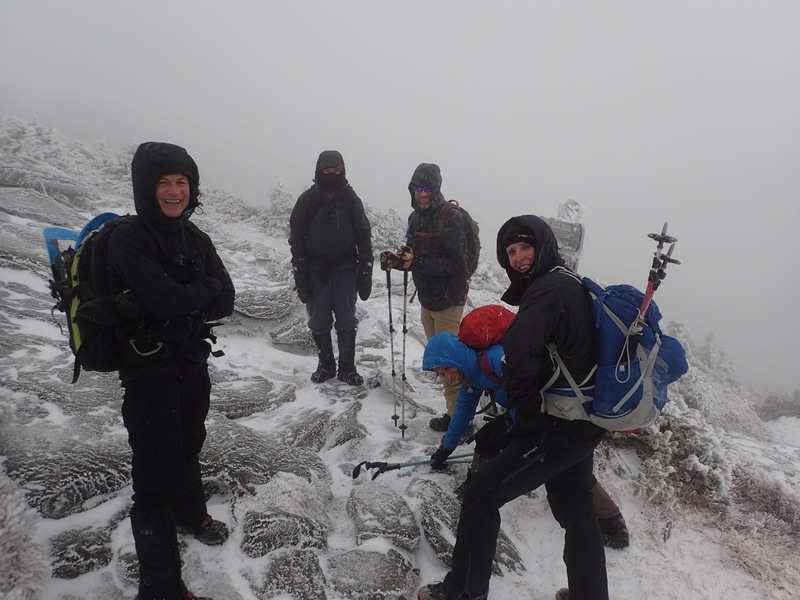 After getting on packs and spikes we started up at 9:30 in a brief snow squall. The skies were overcast and stayed that way the whole hike. As we passed the end of the sanded section of road we saw the folks I’d spoke to had driven too far and were in the ditch on the side of the higher icy section. A few of us helped push their car back onto the road, and I waved back another car that was about to repeat the same mistake. After this pre-hike work out we headed up the road and Eagle’s Cut Trail to reach the Sunset Ridge trailhead around 10:30. We played leapfrog with our car-in-the-ditch friends on the way up to the summit. The trails were a little less icy than the road, but only a little. This would have been impossible without spikes. This was a very strong and fast group, and I was struggling not to hold them back, but we all made it to the summit around 12:30. No views, as we were in the clouds. 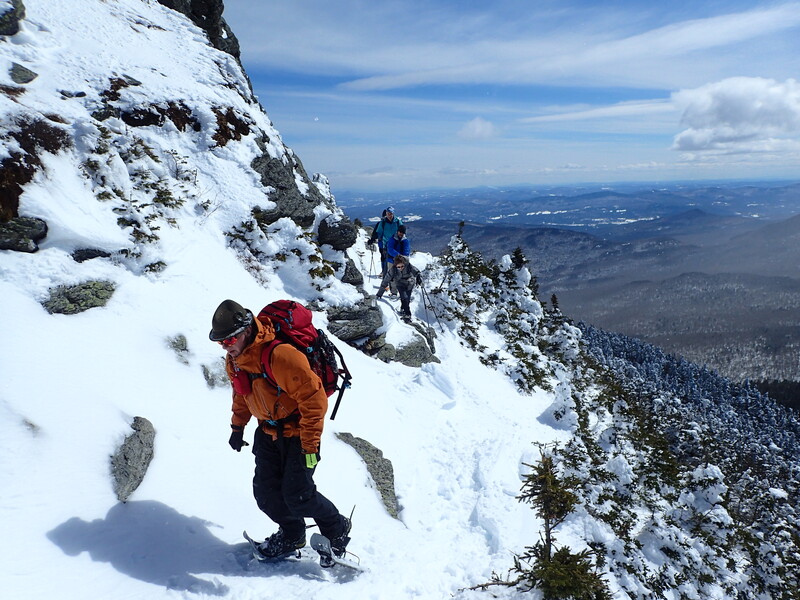 It was cold, but not frigid, and the wind was strong, increasing to the point where it was a little difficult to stand as we crossed the ridge. 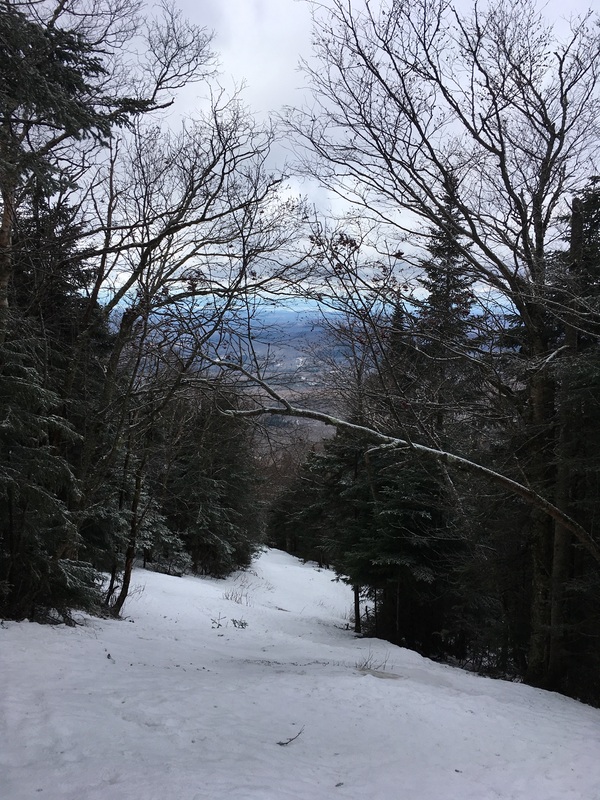 At about 1:30 we reached the top of the Upper Teardrop ski trail, which was a lot easier to spot then some of us remember. I’d never taken it, but based on Tracy’s recommendation, and in light of Jim’s deadline, we decided to take it down instead of continuing to the forehead and taking Maple Ridge as planned. The surface was rock hard so there was no danger of us messing up any ski tracks. We made great time going down, reaching the CCC road around 2:20, and getting back to the cars around 3:00, leaving time for Jim to join us in some snacks and unwinding before we all drove back down. A great day with a great group! Participants: Jill George, Robynn Albert, Tracy Sweeney, Mark McLane, Jim Watkins, David Hathaway (leader). Our Young Adventurers Club explored Ethan Allen Homestead on Saturday (2/17), bundling up for a sunny trip around the icy, snowy trails. Many thanks to Winooski Valley Park District and educator and AmeriCorps member Juli Tyson for teaching us about the birds of the park! ~Michelle Connor, YAC leader. See outing pictures on Facebook. 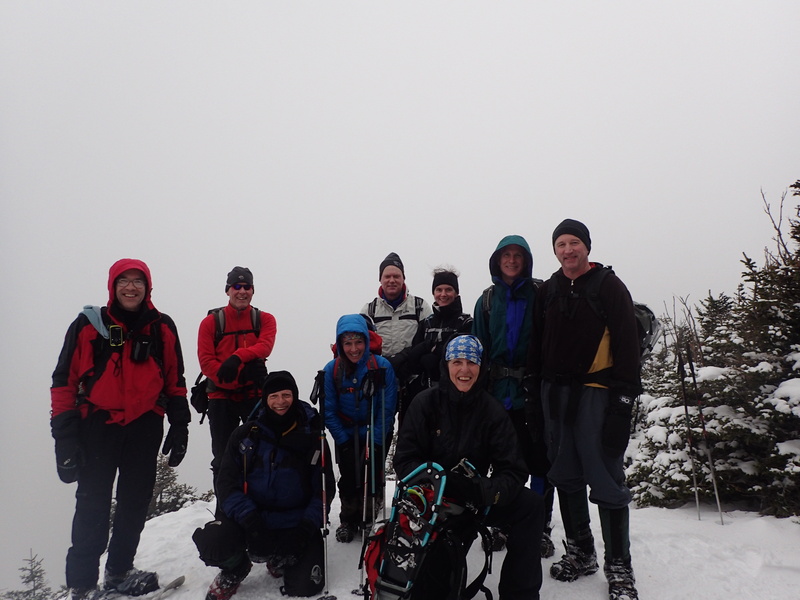 Six GMC hikers signed up for the Mt. 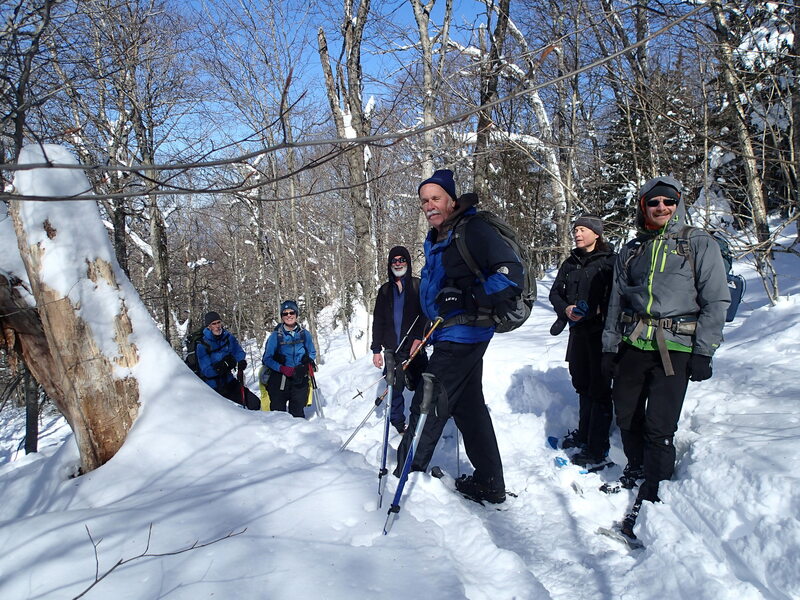 Abraham snowshoe hike. 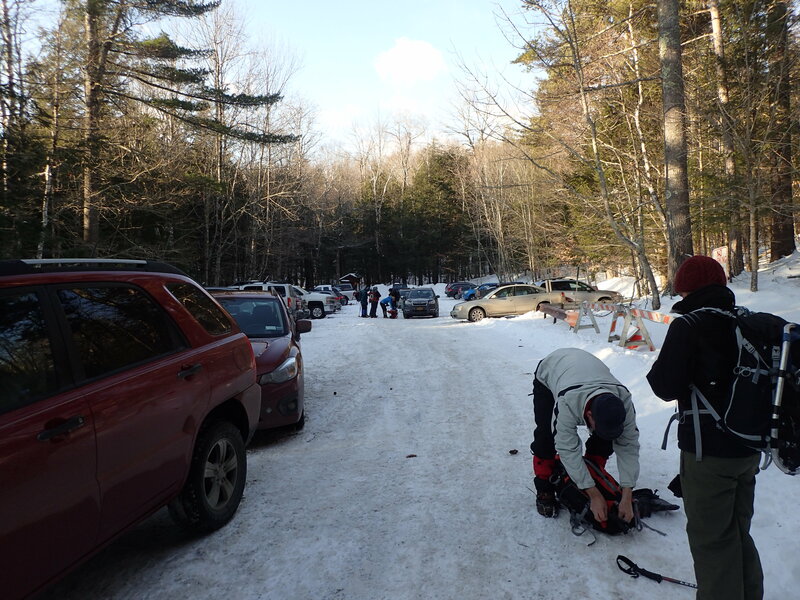 We met at 9AM at the Hinesburg P&R and took 2 cars from there to the small parking lot at the Battell Trailhead (9:30AM). There was wet snow on the drive down Rt. 116, but it never changed to rain on the trails. The snow was a little clumpy at lower elevation but still fresh powder higher up. 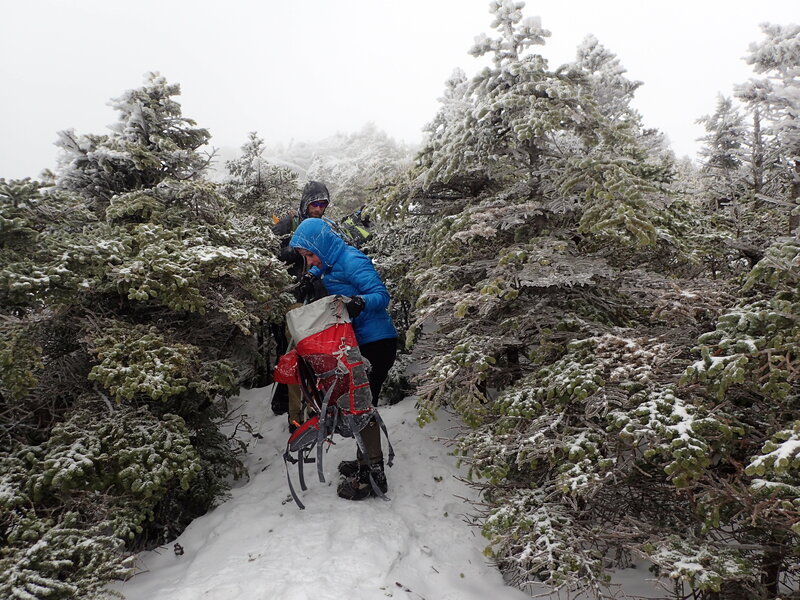 The trail was lightly broken by one or two hikers before us, and the recent snow made for gorgeous scenes through the changing woods. 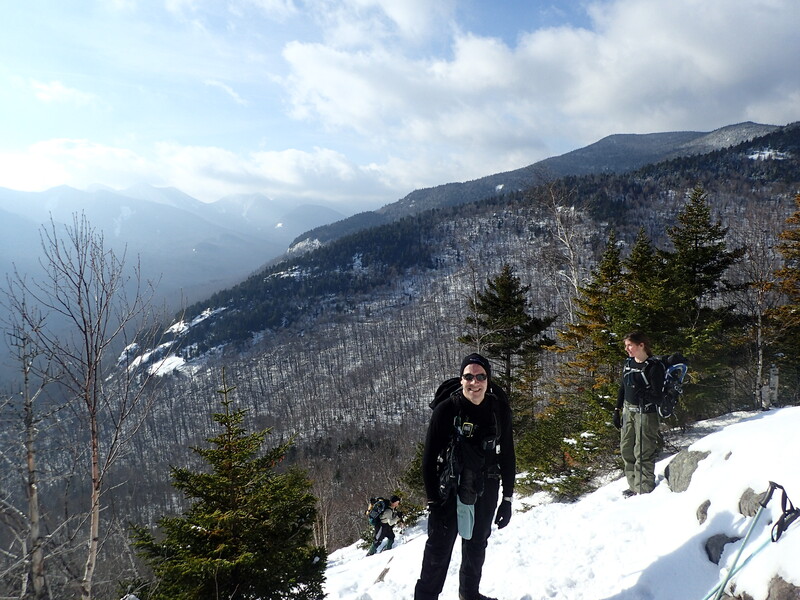 We took a short food/drink break at the Battell shelter on the way up and down, and made it to the summit in about 2:30 hours (12 noon) and back down by 1:30PM (including a few breaks). 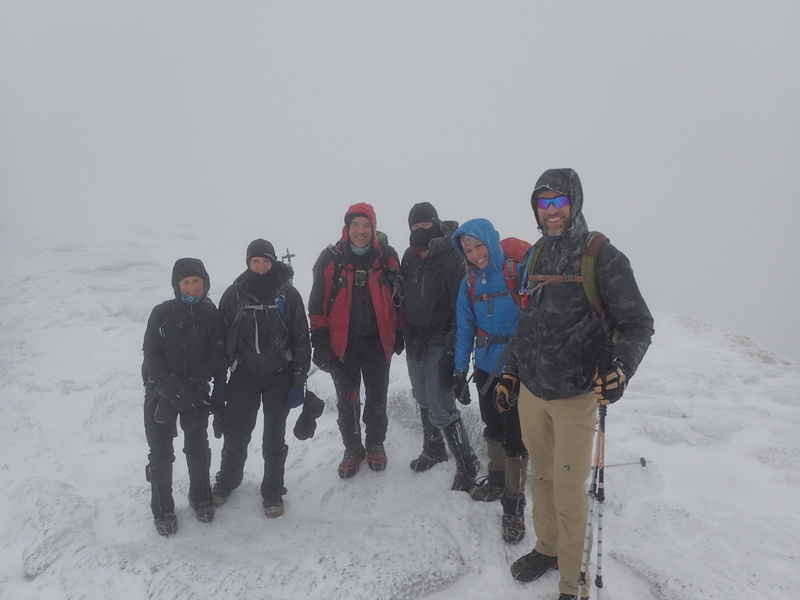 The summit was in thick clouds, and a steady breeze kept us from staying up for too long. 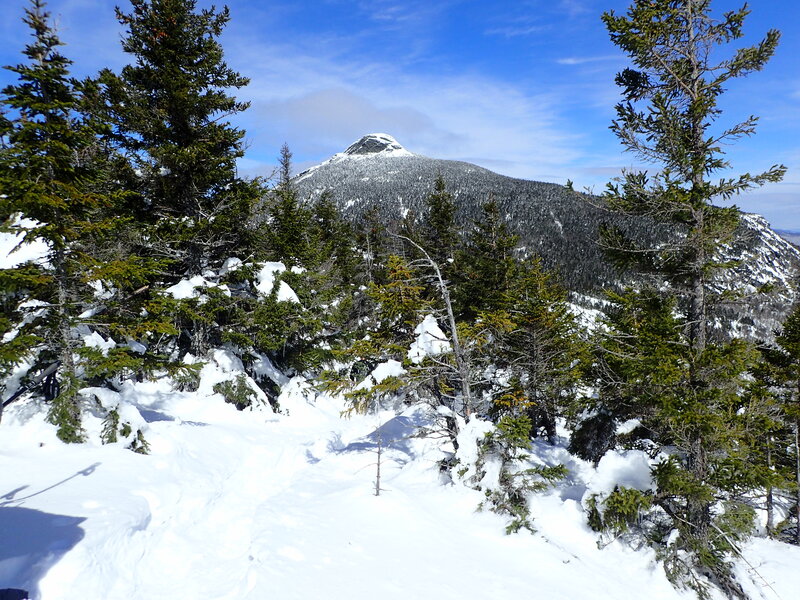 We saw only a few other hikers on the way up, and a few more on the way down – as usual, the Battell trail was uncrowded, even on a very good weekend day for snowshoing! 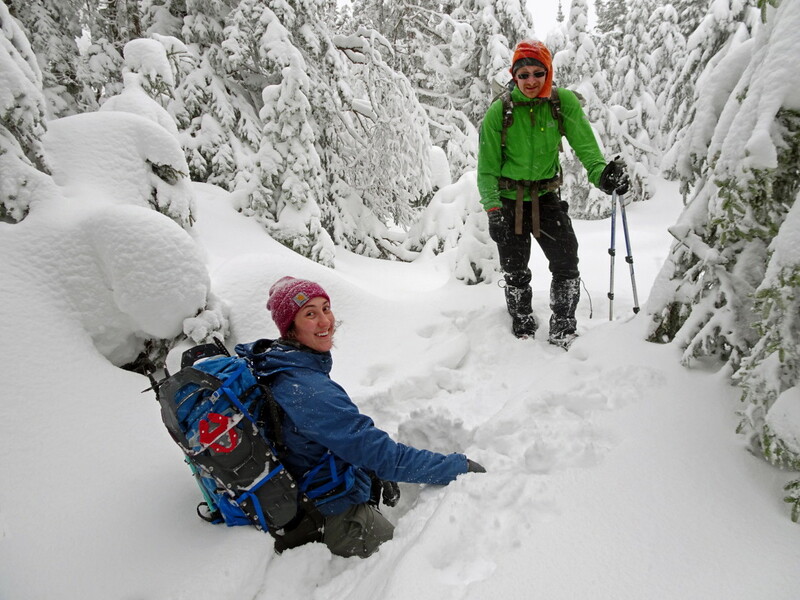 A few takeways: poles are always good to have; snowshoes with less aggressive traction clump up faster; if your hands tend to get cold, then don’t leave your mittens behind just because it feels warm at the trailhead; moisture management – adjust layers early and often. We made it back to the Hinesburg P&R by 2:30. 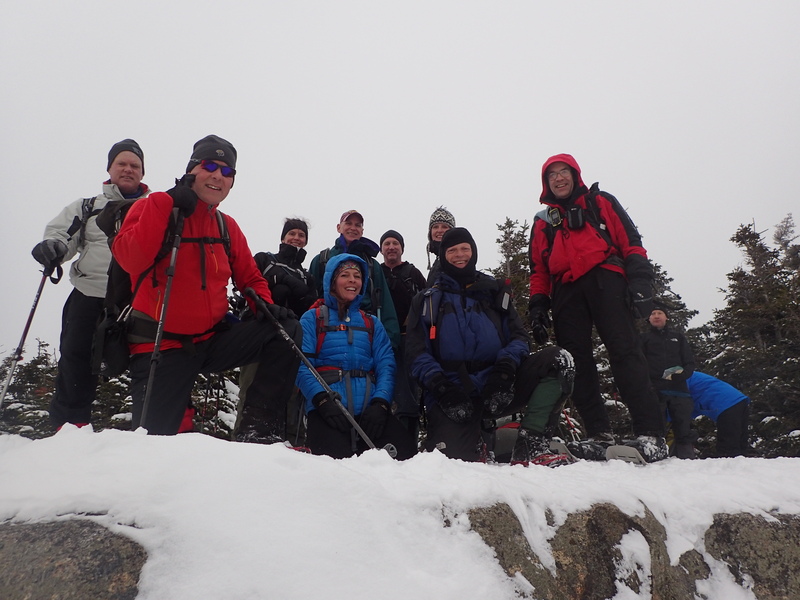 All in all, a wonderful winter hike with a fun group of people for this first-time organizer. Participants: Ali Lopez, Sunny Kim, Lisa, Steve Titcomb, David Hathaway, Dana Bolton (leader). More photos on meetup page. This will no doubt be one of if not the most interesting trip reports I’ve ever written. It was quite the day and evening! The group at one point could have totaled 12 but due to injuries, skiing, dog sitting issue, etc. the number ended up being 5 including me. Four from VT met at the Starbuck’s on the Shelburne Road at 6:45 am, piled into my car and we headed to the Ausable Club lower lot to meet Richard who’d driven up twice in three weeks from New Jersey to join us. 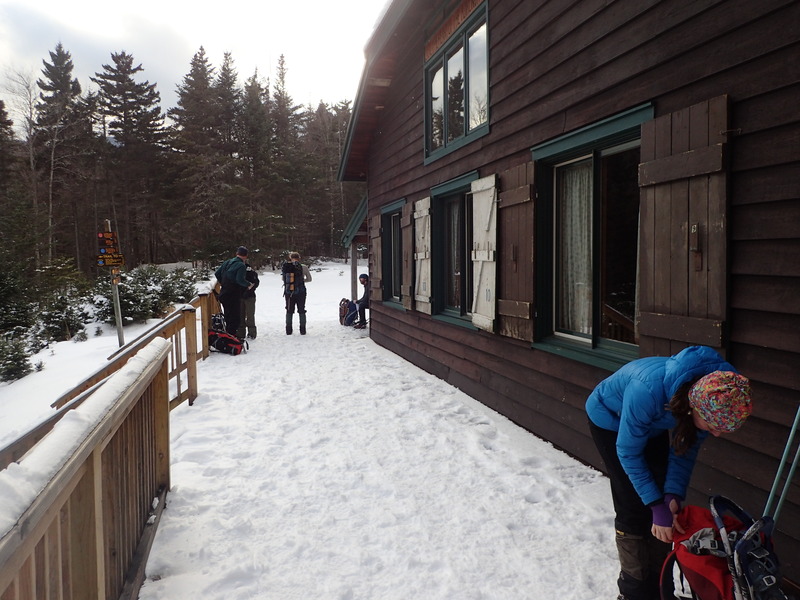 We signed in around 9:00 am at the ranger station at the gate, then up the Lake Road we headed with hard packed conditions, warm temps, two snowmobilers from the Club and the sun trying to peek through. At the Beaver Meadow Falls turn off, surprise of surprises, NO ONE had broken trail…oh boy! 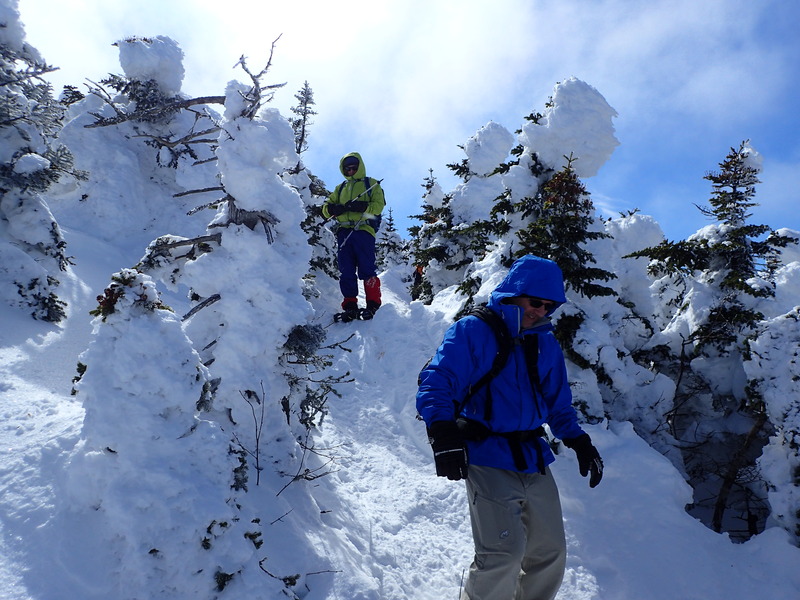 From there to the Gothics summit, we encountered off and on ice, knee to thigh to waist deep snow (at least my waist!) and high winds with decreasing visibility. 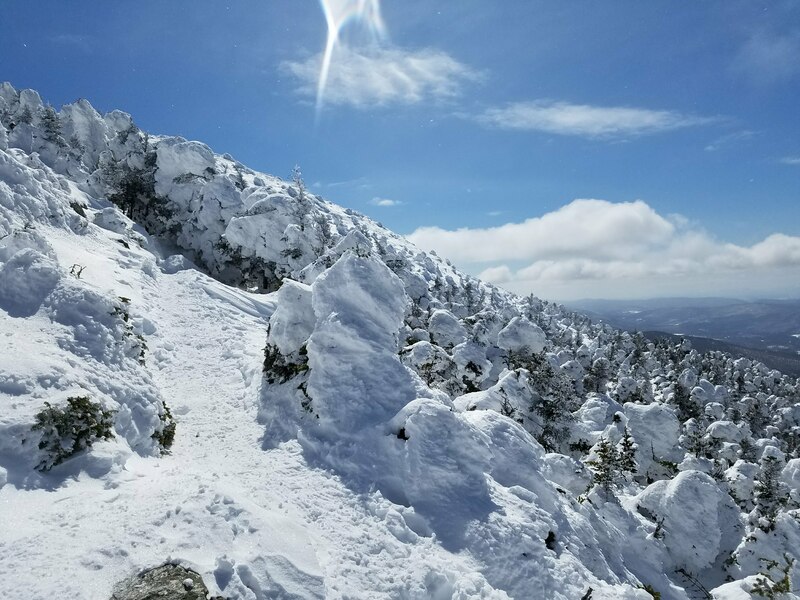 With five strong hikers taking turns breaking trail with almost no breaks, we hit the Gothics summit around 2:45 pm – six hours after we started from the Lake Road gate! Now things get interesting…as we’re descending to what we expect to be Pyramid, we encounter cables. There are no cables on the route from Gothics to Pyramid….hmmmm. With drifts and buried signage, we took a right rather than the left we should have taken and ended up on the Ore Bed Brook trail; at this point, realizing our mistake and with the tremendous amount of ice we’d encountered on the descent, we collectively and quickly agreed we were at the point of no return, so we continued down. Collecting at the Saddleback junction with quick food and drink in our bellies, DEC signage told us 2.8 miles to John’s Brook Lodge. 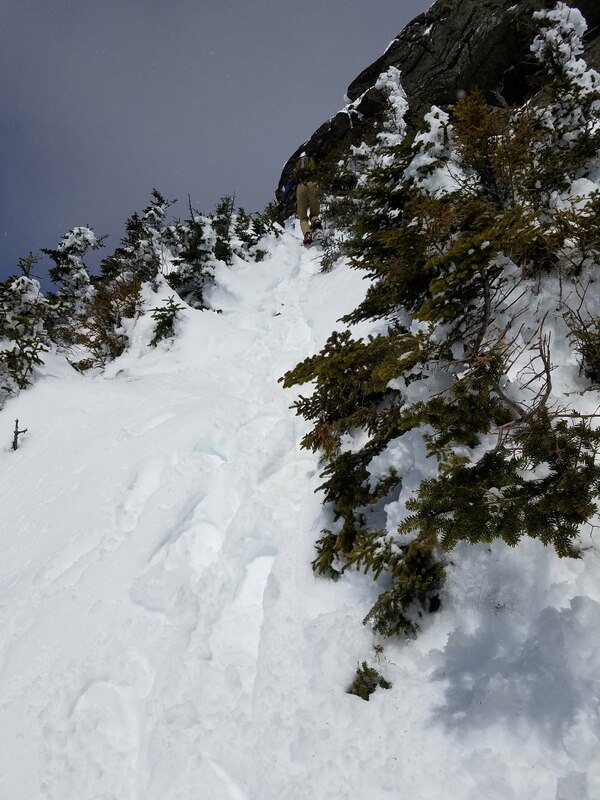 As we headed down, we ran into the first people we’d seen since we left the Lake Road, a boarder and skier, headed up to descend the slide. We hit JBL at 4:45 pm, where the caretaker told us there was a warming hut about 100 yards down the trail where we’d be greeted with hot chocolate by its caretaker…you didn’t have to ask any of us twice! We spent a bit of time there and then made record speed, 70 minutes, from JBL to The Garden. Headlamps came on about a mile or so into the trek, and then, The Garden parking lot…..with about a dozen dark cars and no voices to be heard but ours. I’d made a reservation at The Ausable Inn on Thursday for 5:30, so by the time we hit the lot at 6:30 and had reception, I called them and apologized profusely for our no show. The said they were booked up solid the rest of the night. Down the road we headed into Keene Valley….and lo and behold about 15 minutes into the walk, one of those cars from the lot had taken life occupied with two saints, Joe and Will, who’d just come off Big Slide. They were thankfully agreeable to take us to our cars…how fortunate were we! And they’re GMC CT members as well…very cool! I hopped in with them, then we picked up Richard who was quite a bit ahead of us and headed to our cars. $20 richer, we bade Joe and Will goodbye and then headed back to KV where Tom, Mark and Darren had been at The Ausable Inn for about 10 minutes, waiting for us outside. I had a pretty good feeling that the Baxter Mountain Inn on top of Spruce Hill would have a table for five, an empty couch in front of their roaring fire and cold beer on tap; thankfully all of those things were true! We each made a toast around the fire as dinner was being made, ate heartily, left the restaurant at 9:00 pm sharp, light to heavy snow falling from there to Starbuck’s lot, arriving at just after 11:00 pm. A long, rewarding day! I am grateful my companions were level-headed, no one freaked out, the temps were warm, for the greeting of the warming hut caretakers and Joe and Will, our angels from the mountains! 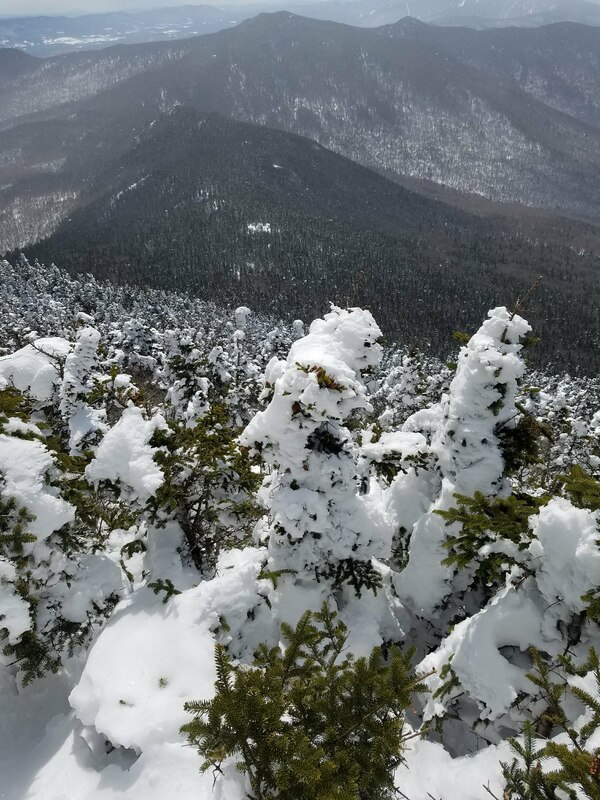 In closing, Richard said it best at Baxter Mtn. “this hike kicked me in the head!” We all laughed but I think there was consensus in his comment! I will not soon forget this day and its memories. 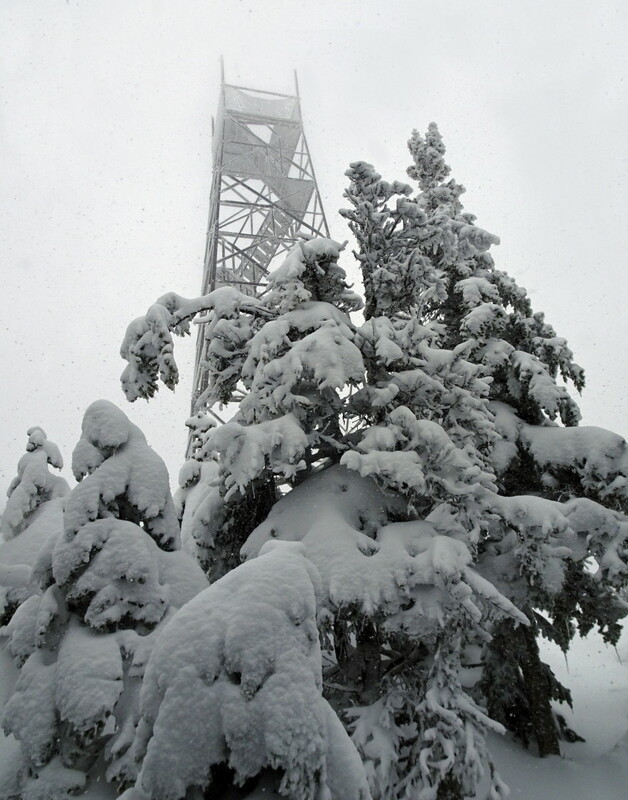 Despite having to compete with the Super Bowl later in the day, 5 hikers signed up for the usual winter trek up Belvidere – from the parking lot on route 118, up the LT, then the side-trail over to the tower, and return.Five or so years ago I would advertise this trip in winter as ‘3 hours up, 2 hours down, plus 1 hour thrashing around lost in the snow’. This time we did not get lost much – and had technology to let us know when we were wandering away from previous routes – so we were able to avoid the ‘thrashing around lost’ portion. 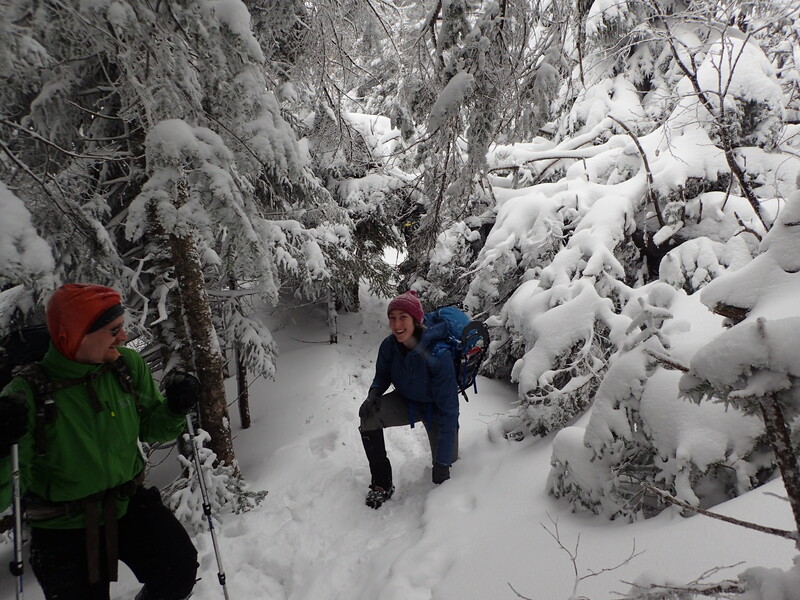 The trail had an almost-solid crust layer under 4-5 inches of snow, so we went up without snowshoes, just microspikes. The top snow-layer was soft, and each step sank in a bit, and made the travel a bit tiring for the esteemed trip leader – but we all made it to the top in about 2:45 hours. 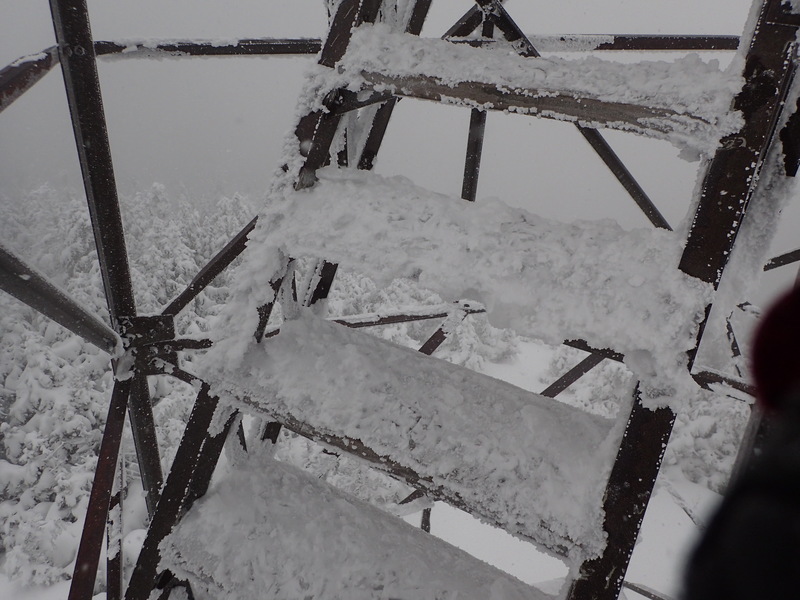 A few went up the firetower to inspect the inside of the cloud at a better vantage point, but most doubted the wisdom of that and stayed below. 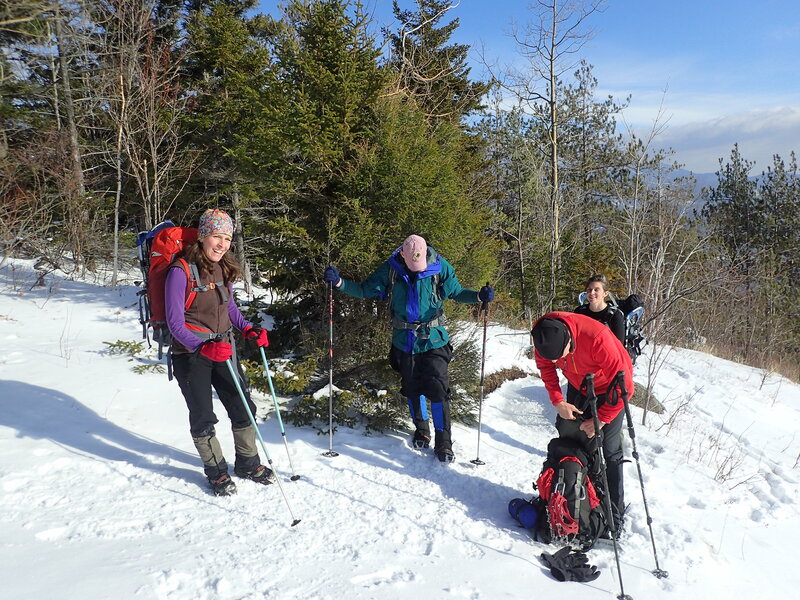 The summit was relatively cold, being winter in Vermont, so we just stayed about 15 minutes and headed down. We had post-holed just a little bit coming up, not a big problem, but enough to make us wary of going down without them, so most wore snowshoes going down. The total hike took 4:40 hours, and we were back to our homes well in time for Super Bowl kickoff – or whatever else people did that evening. Participants: Sheri Larsen, David Hathaway, Kevin Burke, Emily Desmeules, Rich Larsen (leader). 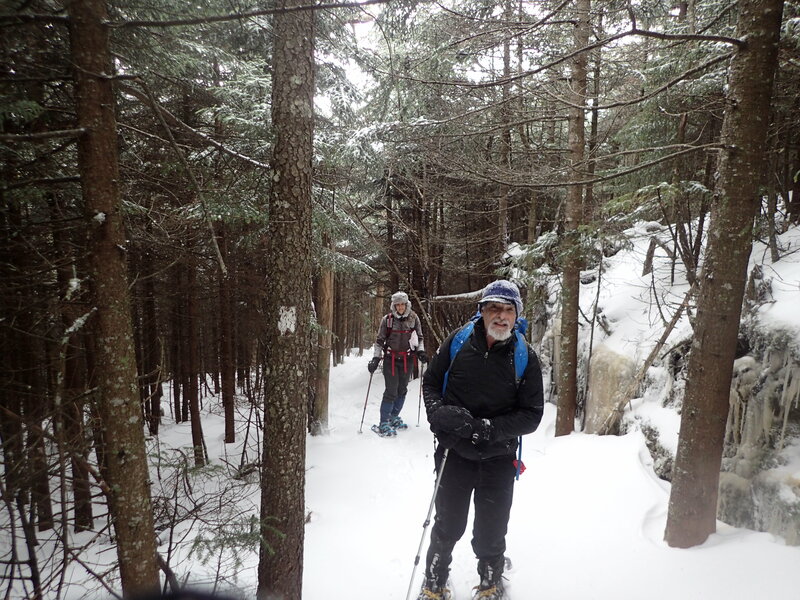 As our New Year’s eve outing to Bolton Lodge was frozen-out, we rescheduled on somewhat short notice and turned the traditional President’s Day outing (held every Sunday after the Burlington Section annual meeting) to be the Bolton Lodge outing. It was 40’s and partly sunny, and there was left over Annual Meeting lasagna, Dave’s hot cider, and Nancy’s oyster stew and brownies, along with treats brought by others. Thanks to Nancy McClellan, Dave Hathaway, Paul Houchens, Kim Farone, Brian Williams and Phil Hazen for a fun and food-filled day. Trip ‘leader’ Ted Albers. 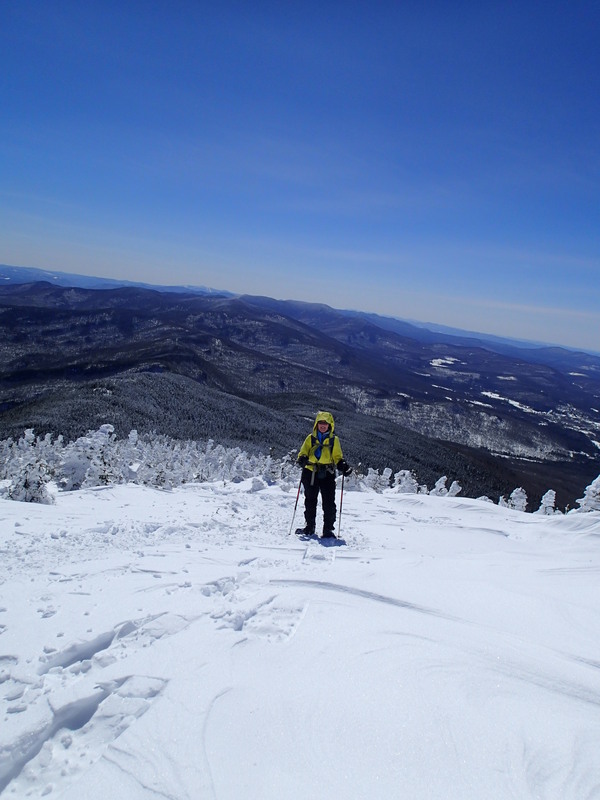 Another great day in the Adirondacks we had! Seven of us met at the Starbuck’s on the Shelburne Road at 6:45 am, piled into 2 cars, quick stop in Port Henry at the Stewart’s, then back on the road to The Garden trailhead, arriving around 8:45 am. It was by pure luck that we were able to park here, right in front of the attendant booth, creatively creating two parking spaces! And luckily, too, Jim and Richard were already there, arriving from NY and NJ, respectively. Anyone coming after us would have had to go elsewhere for the day. After parking, hellos, getting our gear squared away, intros, run down of the day and the start of January 20 trivia, we were on the trail by 9:30 am ish. 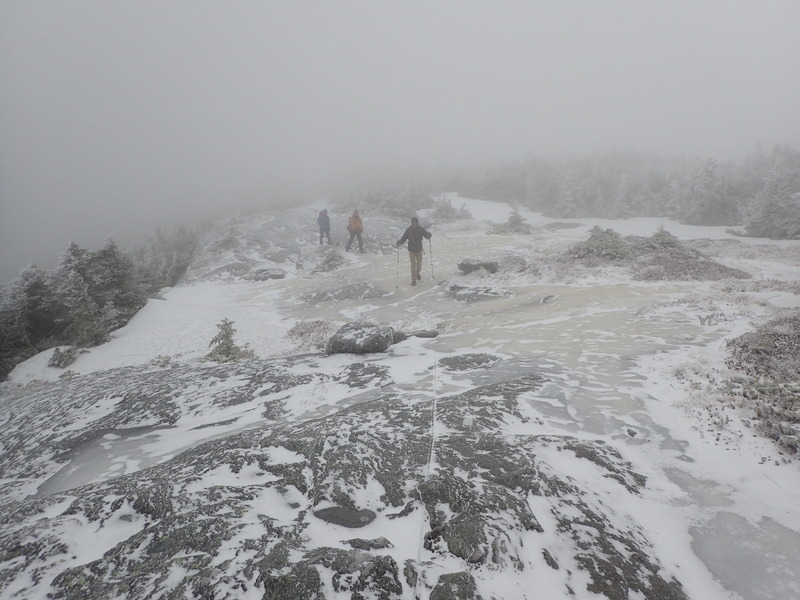 We headed to the Brothers first, where conditions were hard packed, with some ice blobs here and there but nothing that was so serious that was worrisome. All wore either spikes, shoes or alternated during the day. Met some here and there along the way; weather was spectacular (not dealing with the frigid temps of late was SO nice!) with the clouds breaking and clear blue skies en route and full-on over all three Brothers. This changed before the intersection to head up to Big Slide, where clouds and wind moved in. No view at the summit, a bit of chit chat, a group photo, then back to the junction where we ate lunch, then headed on our descent via the Johns Brook Valley trail. At the first intersection, Jim mentioned he wanted to say hi to a friend who was working at the Lodge and if anyone else wanted to come along. Seven of us said yes, Tom and Tracy headed back to The Garden. The Lodge is spectacular with a huge deck, new signage, plenty of cleared land around it. Nice fire awaited those who popped inside for a bit, with a very clean appearance. It was well worth the 1 mile diversion. The rest of the outbound was smooth and we returned to our cars around 4:15 pm. Some changed clothes, then we headed to The Ausable Inn for eats and adult beverages, back at the Starbuck’s for the Vermonters around 8 pm. A great way to end a great day! 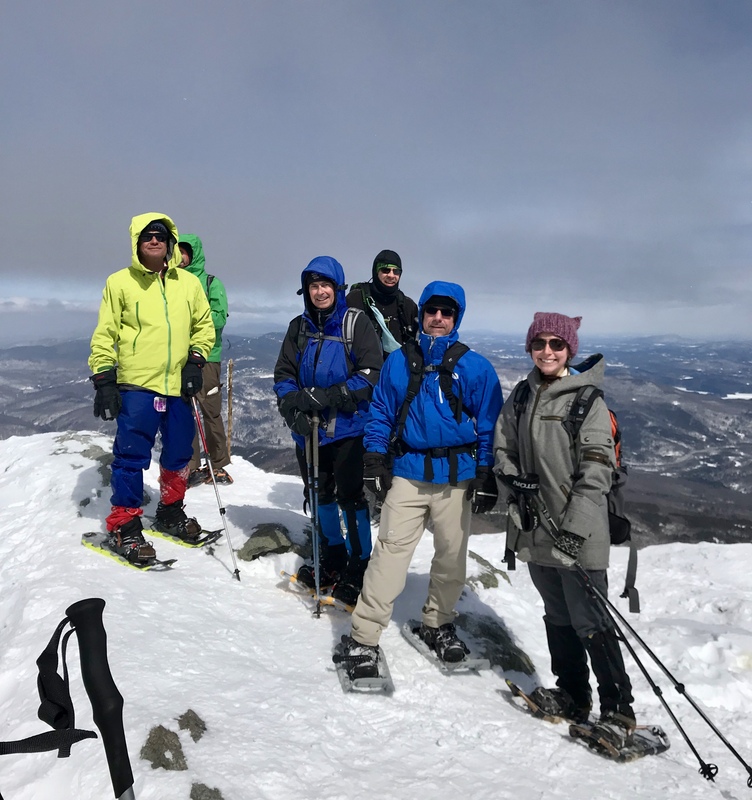 Participants: Richard Dabal, Dave Churchill, Mark McLane, Tom Smith, Tracy Sweeney, Jim Schneider, Jody Dunkley, Dave Hathaway (photos), Robynn Albert (leader). View of Gothic from the rail up the Brothers (above). 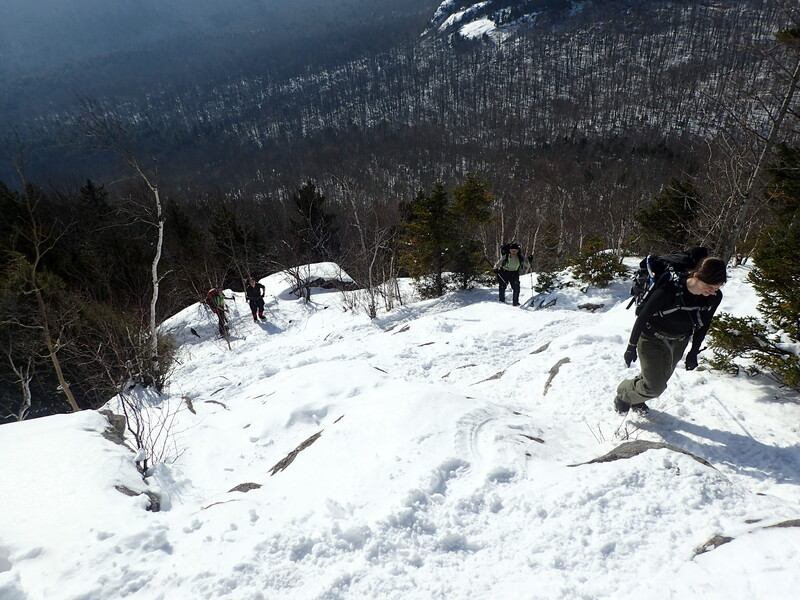 On the summit of Big Slide (below). We got the last two parking spots at the Garden. 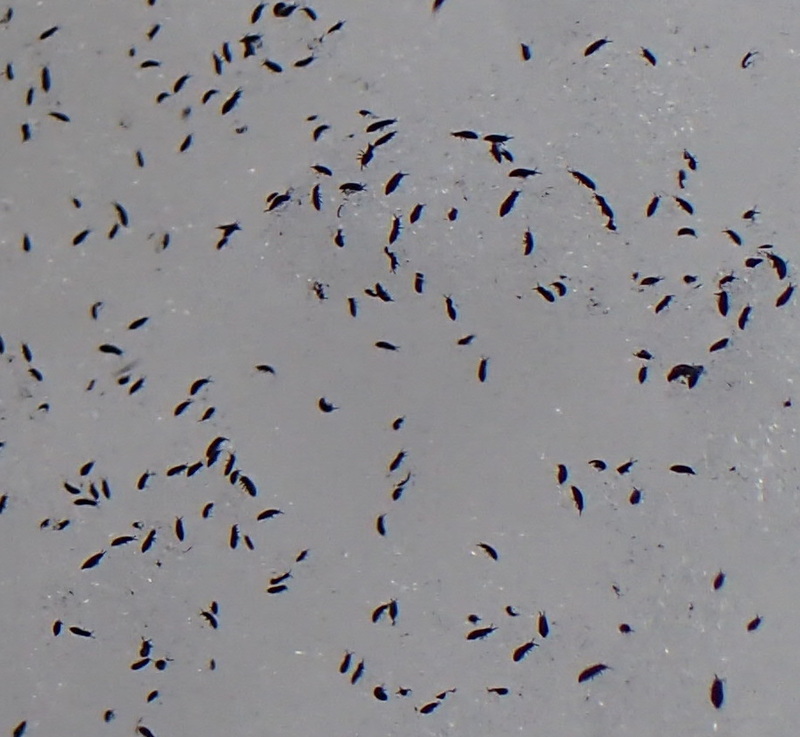 Closeup of “snow fleas,” which were out in abundance. With the drop from high 50s F the evening before to below 10F in the morning and the wintry mix that came with it, roads were bad. So several people canceled and we ended up with only three people from Underhill Center, each with less than three miles to drive to the 9 AM meeting place. 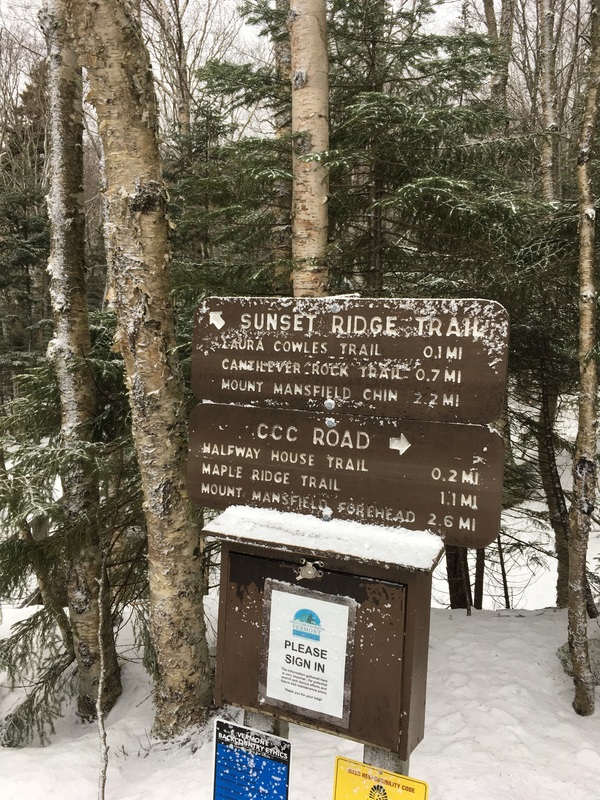 We took one car up to the trailhead, and needed AWD and four good snow tires to traverse the last bit of road from the former Maple Leaf Farm to the trailhead and started up the trail around 9:20 with light snow falling. 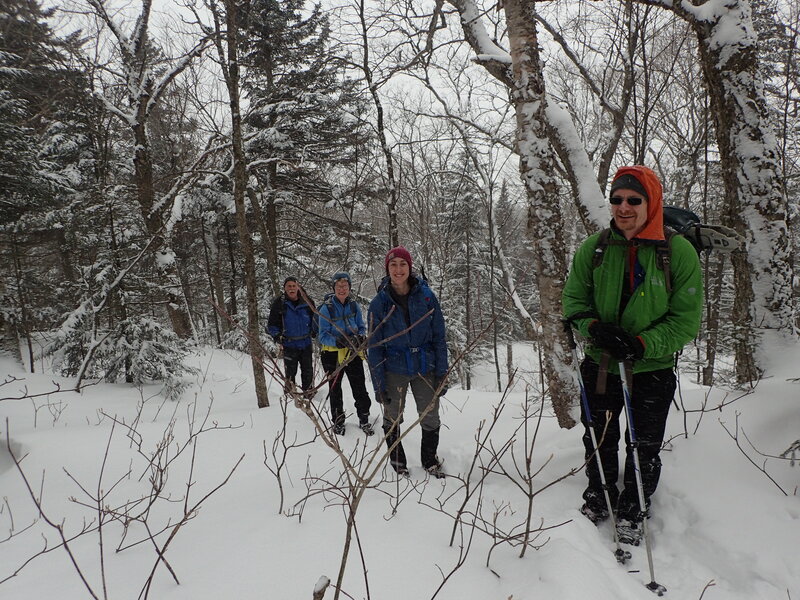 One of our group wanted to be back by 1 PM, so we did a slightly shortened version of the planned trip, heading up the ski trails to just north of Twin Brooks tenting area instead of taking the Nebraska Notch trail. 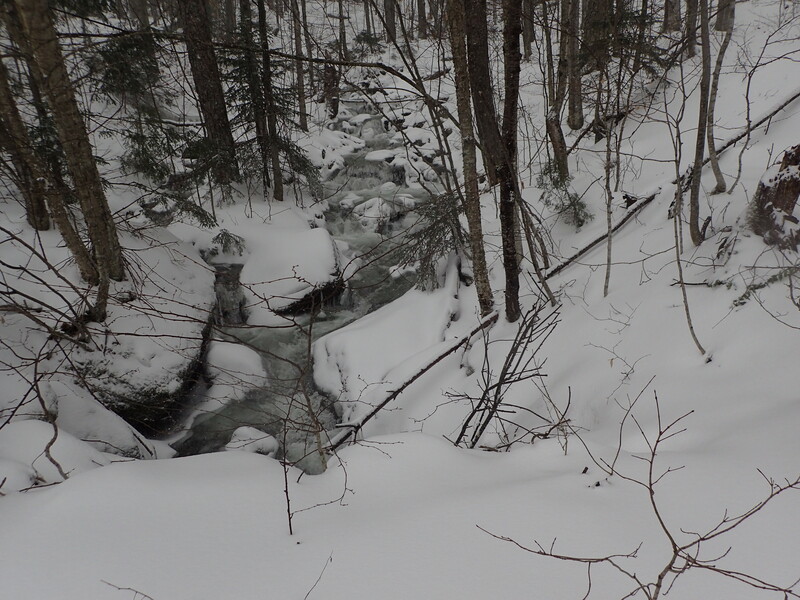 After the thaw of the previous two days there was still enough water under the top layer of snow to make for around a lot of wet spots as we headed up the ski trail, and we battled repeated buildups of ice balls on our snowshoes. 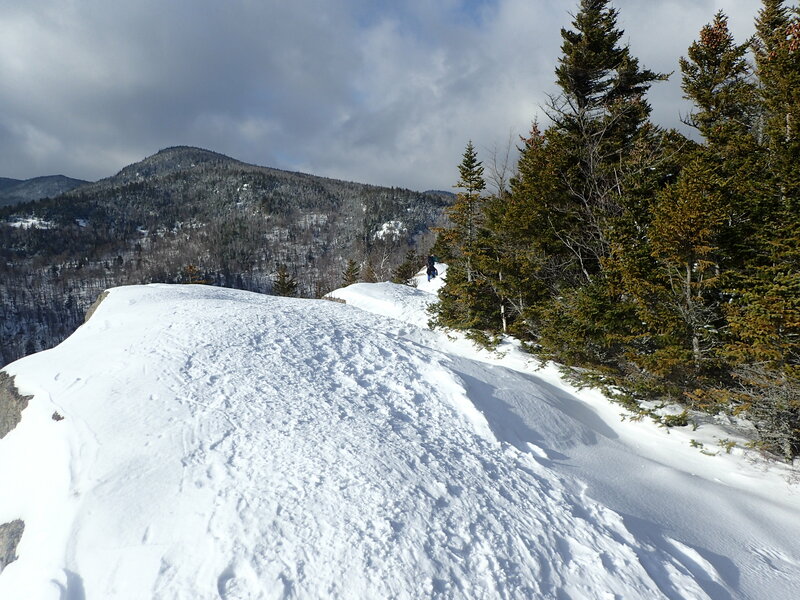 We hit the Long Trail around 10:20, and from there ran into a lot of crusty snow that was often not quite strong enough to hold our weight, even with snowshoes, so our pace was a bit halting in spots. We reached Butler Lodge around 11:15 where we spent about 10 or 15 minutes for lunch, then headed back out into the cold. 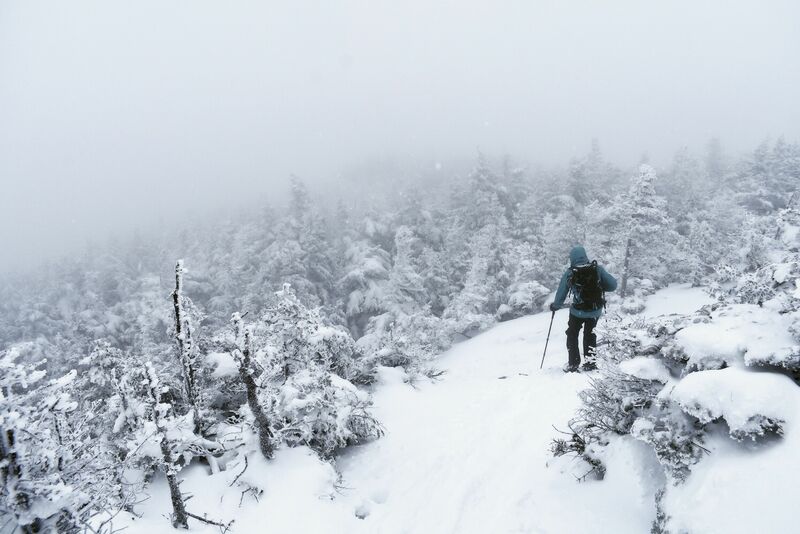 The snow had stopped, but the temperature had been dropping, and the wind coming up the trail was fierce. So the first part of the descent was pretty cold, but it improved markedly as we got lower, and we caught glimpses of blue sky above. We passed a couple other Underhill Center folks with three dogs near the bottom, and reached the car just before 1 PM, where we met a couple other folks headed up Nebraska Notch trail. Participants: Rob Gordon, Laura Selman, David Hathaway (leader).